Have you wondered what it would be like to have a sukkah in your own backyard or on your deck? For many Jews, a personal sukkah heightens the enjoyment of the Sukkot holiday, which brings us outdoors, under the stars and into the beautiful fall weather, to “dwell” in this temporary shelter as instructed by Torah. 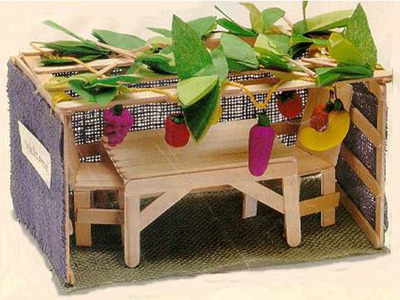 Over a dozen years ago, FJC purchased a sukkah kit to make available via lottery to a member household each year. The kit is easy to assemble and can be completed in under an hour by two individuals. If you are single and need help, we will put out a call for assistance. Whether you sit, eat, sleep or hold a Sukkot feast with fall foods inside, this Sukkah holds the promise of a memorable holiday. The lucky winner will be announced at the High Holy Days.